The jury is still out on the benefits of Barley Life. Mom is in the 'try it and see' mode at the moment. We will be reporting back as results merit. But for all those who've never heard of it, let me share what we've discovered about this whole food supplement so far. Barley Life came to our attention when a dear friend heard about mom's pancreatic cancer diagnosis. Mae wrote immediately of her concern for mom's health and her pledge to keep her in her thoughts and prayers. She had a pretty good idea how shell-shocked we all were. Mae had been diagnosed about 10 years earlier with an aggressive form of ovarian cancer and she identified with our struggle completely. She also urged us to consider the Barley Life supplement to aid in boosting mom's blood counts and her immune system throughout the treatment. "Good nutrition helps one feel better, in my experience, anyway. An AIM Company product called BarelyGreen, now calledBarleyLife, helped so much. Blood counts came back, as did strength, using this a few days after each chemo treatment. It makes getting good nutrition easier on ones system. each one is different, though. I just thought I'd share the information, in case you or your mom are interested. I will keep up with her journey via caringbridge and will keep praying for each of you." "The BarelyLife really made a difference for me. I had to use the caplets, as the juice was hard to take. It made such a difference -- for a test my docs asked me not to take it after one treatment. My counts would go non-existent after a treatment -- white count 9, not 900 or anything but just 9. redblood would go to 2 or some such -- once lower :? no bloodtransfusions, as I would let the chemo work for one week and then take the BarelyLife for two weeks [until the next treatment -- my counts were actually better just before the second treatment than they were before the first.] I am sure it helped -- the month I did not take it -- my counts dropped from chemo and did not rise at all by the next treatment time -- they postponed that treatment for one week, while I used the BarelyLife -- my counts were within normal, but not as high as the other months. The trouble I had was being able to eat -- there were times when this was all I was able to keep down -- that is why I used the caplets instead of the juice -- though with the juice, when I could use it, I would feel better very quickly and have energy to do something." As you can see by her story, the Barley Life did not take the place of standard treatment for her cancer, but rather aided in the recovery of her good health. Today, 10 years later, she is still in remission from her ovarian cancer. I would never make the claim that Barley Life saved her life, but she obviously thinks it made a profound difference in her outcome. Because of her experience, and because she is a trusted friend, mom and I ordered the Barley Life supplement and have begun our own experiment. More on that in a minute. First, what exactly is Barley Life? 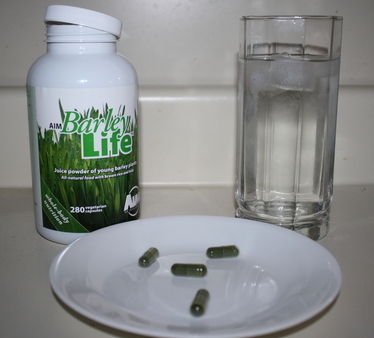 "AIM BarleyLife is an all-natural, green barley grass juice concentrate that helps provide the daily nutrition you need to develop a strong foundation for good health. The power of BarleyLife® is found in the nutrients of young barley leaves. Research has shown that green barley juice is abundant in vitamins, minerals, antioxidants, phytochemicals, enzymes, amino acids, and chlorophyll. BarleyLife® provides anti-inflammatory properties, immune-system support, and cholesterol-lowering effects. The daily use of BarleyLife results in a feeling of total wellness." The company also offers this disclaimer: "Products of The AIM Companies™ have not been evaluated by the U.S. Food and Drug Administration (FDA) and are not intended to diagnose, treat, cure, or prevent any disease or illness. Results may vary per person." Once again, we strongly suggest talking to your licensed health care provider about the use of Barley Life if you are contemplating trying it. The product comes in a powder, which can be mixed into a juice, or a capsule. With mom's ongoing nausea, the powder did not sound appetizing, so we opted for the capsules. And this is how we are conducting our experiment. After consulting with her oncologist about the product and getting his okay, we decided to start the BarleyLife at the beginning of a Gemzar cycle. They took bloodwork, gave her the chemo treatment, and mom went home and began the BarleyLife. These are the results thus far. The first set of blood counts are from the chemo cycle without the BarleyLife, sort of a baseline. We can use these blood counts as a comparison to see how the supplement did. Week of 07-15-11 was her resting week from chemo. No Gemzar and no bloodwork. As you can see the blood counts still dropped into the too low range. Mom is still only taking about half the dose recommended on the BarleyLife supplement. She will continue increasing the dose during this next round of chemo and we'll see if that helps stabilize the blood counts. We are hopeful that the supplement will be helpful, but are wary of "too good to be true" claims about the product. Keep checking back here for updates. The battle rages on!